Just finished my last class of my seventh decade, in Idaho hosted by Andy Kemp and Bob Houzenga of MTG (Midwest Training Group, midwesttraininggroup.net) and Bob Smith of SAFE (Security Awareness and Firearms Training in Fernan, ID). 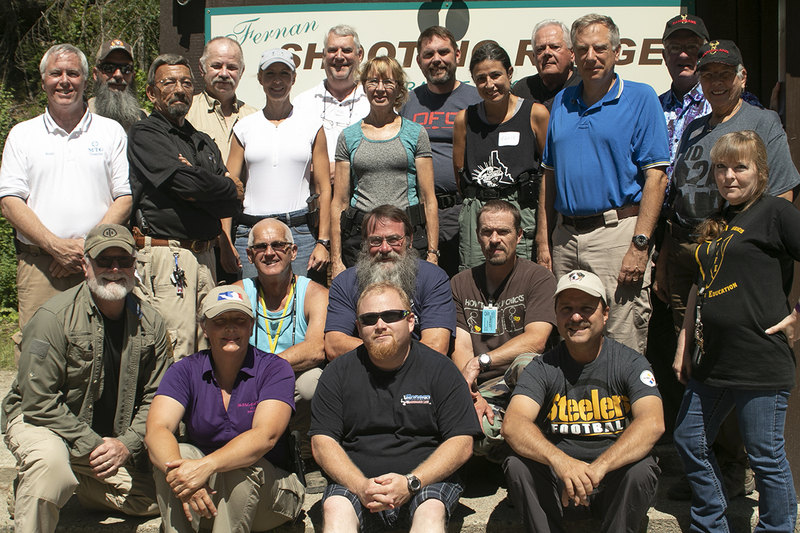 It was 40 hours of “fun in the sun,” and lots of classroom time in our MAG-40 Armed Citizens Rules of Engagement course. For a change, yours truly wasn’t the oldest person there. Lots of retirees on board. We are in a time when the anti-gunners are turning to age limits. No rifles or shotguns for 18- to 21-year-olds, they demand, and they’re hinting at taking firearms away from old folks so they don’t suddenly go homicidally senile and kill everyone around them. Well, guess what? The old farts did pretty darn well. We had over 20% female attendance, including more than a couple of grandmothers. Top shot among those ladies was a willowy 72-year-old who not only outshot all the other women including the more “buff and tuff” ones, but most of the men present: her 295 out of 300 put her solidly in the top five of the couple dozen students. She did it with a full-size Smith & Wesson M&P 9mm “police service pistol” too, not some stereotypical “cute little ladies’ gun.” With 28 people shooting the sixty-shot qualification course including the five staff members in a “pace-setter” demonstration, the single highest score was fired by a gray-whiskered old goat with a compact SIG 9mm. “Most Improved Shooter,” by majority vote of the training staff, went to a silver-haired senior citizen who was running what may have been the toughest gun to shoot on the firing line that day: a little Ruger LC9 9mm. That’s a short barrel pistol weighing barely over a pound fully loaded, but which has a double-action-only trigger pull that requires several pounds of pressure per shot. He finished with a 95% score. Beware of old folks. They’ve been around enough to learn to listen to the lessons, follow shared wisdom acquired long and hard by others, and achieve their goals. Thank you, brother and sister geezers, for easing – and validating—my transition into that eighth decade! There was lots of gray hair in this particular class. 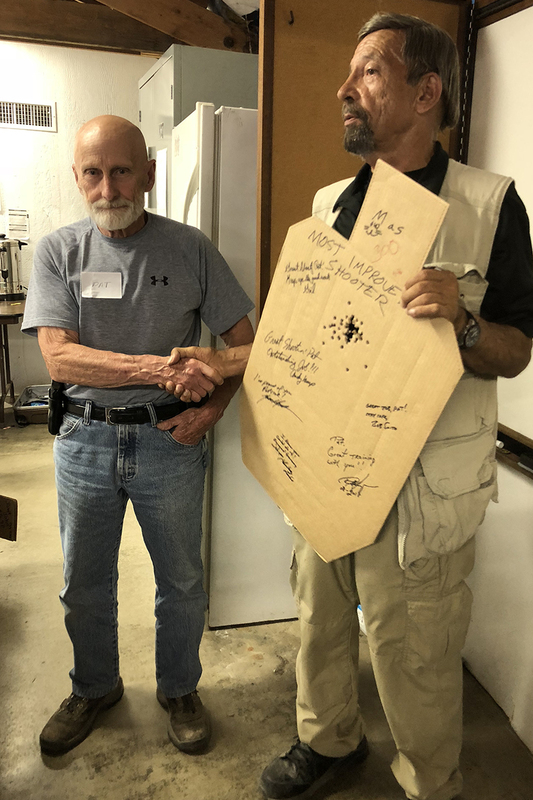 Mas gives Most Improved Shooter award, lead instructor’s target autographed by staff, to a senior citizen who did great with a gun that’s not the easiest to shoot. Great Job as Always Mas: Please contact me I need your help on contacting a couple Sheriffs Departments CCW sections. Stay Safe, God Bless, Tom Kelly, Portland, Or. Is this “Bob Fart” day? I’ve got you by a year (75 in May) and, as 77 year-old Jin above, get out to shoot AT LEAST once a month (fortunate to own rural property) Arthritis is creeping in but years of high recoil shooting have (I believe) enabled me to still shoot a box of 50 .45 auto rounds without (too much) after-pain. I do prefer 9mm but try, on a range session, to shoot several guns of several different calibers (usually 9 mm, .40 S&W and .45 auto) because it’s fun! .44 magnum requires a padded glove and I usually quit after 12 rounds. Rifle shooting also requires some help from a shoulder pad for .270 Win and up (largest being .45-70). Point being made here is keep shooting and you will be able to keep shooting. As you are, I once was, as I am you will be. The wipersnapers look, think, and most get the just of the saying. Hope to see you soon Man. I’m entering my 7th decade, and well, there is hope after all! Congrats to everyone. Age related, naturally degenerative physiological conditions should be considered here by all the “young bucks and doe’s”, cuz if you live long, you too, will be faced with the inevitable. Knives and needles in the eyes, joint replacements, cortisone shots and monitoring blood sugar levels…? Damn, getting to Geezer Division requires much. It’s good to hear that oldsters can still compete with youngsters in at least one sport. I’m not surprised. Because of their numbers and spending power, the baby boomers have dominated almost every trend since the 1950s. I thought we may even be able to make old “cool.” Now that’s a stretch. Here’s a sad thought. Old men have frequently sent young men off to war. WWI comes to mind. Maybe, with our technology, we have reached a point where old men could shoulder more of the burden of war. Of course, young men would still be needed for the toughest and most dangerous jobs, hence they would still do a lot of the dying. I wonder if I wouldn’t rather die in battle than in a bed after fighting cancer for two years. Of course, it would be better to have no wars, or to have robots do all the fighting. These are unpleasant thoughts, but they are something to think about. Poor ol’ pitiful thang… Eighth decade and married to the EP. So underappreciated…(sigh) mercy. Ok, now go buy a new gun and you will feel bettah! Be sure to file a range report for us! Mas, your comments about old age reminds me of a piece of wisdom my father imparted to me in my late teens. He told me “Never pick a fight with an old man – he knows he can’t win a fist fight with a younger man, so he’s liable to just shoot you.”. So I don’t pick fights with anybody and neither did my father. As an old man these days, I realize how much more important a firearm is to an old man/woman who has been trained to use it properly. They do not have the strength and stamina to prevail against young hoodlums, so the carried firearm is all they have between death or severe injury and a long hospitalization from a beating. We old folks are fragile – at least more so than we used to be. It would be a crime for the lefties to remove an old person’s last implement that provides them protection and independence to live out their life in peace. When age and shooting comes up I always love to bring up the following: google George Farr and Camp Perry. 62 year old guy from the North woods. Back in the 1920s he set the 1000 yard record at Camp Perry. With a borrowed rack 1903 Springfield and 30-06 ammo. Oh AND IRON SIGHTS. The record stood for half a century ! I’ll share my favourite old guy tale of the ones I’ve witnessed. About the time I was embarking on my seventh decade I helped instruct an Appleseed shoot in a rural south central Washington farm community. the owner of the several hundred acres was himself near seventy, but activly working his few thousand acres. We things were shaping up for the start of the shoot Saturday morning, an elderly gent slowly but coinfidently walked up to the firing line in the section of the line I was working. I helped him get his chair and kit set up, and soon realised this gent was definitly ALL THERE though nmoving a bit stiffly. Came time to bring the rifles to the line and uncase them. He carried his soft case out to his shooting mat, and as he slipped his rifle out of the end of the case I said to myself “THIS is going to be good”. He had a well used M 1 Garand in clean but well used condition all original. It was evident to me instantly he knew very well what he is about with THAT rifle. We started out with the standard “Red Coat target set, and he did pretty well. Then came a series of sighter squares, five one inch squares, centre and four corners, all on a quarter inch grid. Perfect for sighting in anything. His .30cal holes were easy to spot with the naked eye at our range.. 25 metres. He was VERY good, even if slow and stiff. After about five courses of fire he asked me if he could be done. I said Sure, and we followed protocol to bring his re-cased rifle off the firing line. He was done shooting (he’d fired somewhere near forty or fifty rounds by then) but asked if he could sit and just watch. Of course, sir.. we introduced ourselves and I asked how long he’d had his Garand. I suppose I should not have been surprised, but he said that was his own battle rifle from when he served in Europe during the Second German War…… it was OK for the guys to bring them home once the war was ended. Made perfect sense considering the familiarity he had with his rifle. As we chatted, he told me he’d recently celebrated his NINETY FIFTH birthday….. I allowed as to how I’d be very blessed if I could still shoot like he does when I reach that point. He stayed around until after lunch, and was VERY excited to hear the stories of Lexington and Concord, and two or three of the “Dangerous Old Men”, such as Hezekiah Wyman, Samuel Wittemore, David Lamson… oh, and Old Mother Bathrick. What a delight and honour for me to have met this fine still-dangerous Gentleman. And his rifleman skills were somthing… slow, but he’d compensate for that by staying far away, out of range, and wreak what havoc he could, as did Hezekiah Wyman. He was so tickled to see such a large number of folks ,all ages and skills, (that day we had folks from eight to ninety five on the line and shooting) and watch them pay attention and learn how to be a better rifleman. A bit of a ramble, I hope at least some enjoy it. It is always a privilege and an honor to talk with these older vets – we owe them so much! I love these stories,thank you! Keep up the good work Mas. Well, that means that I AM in my Ninth Decade, although most of the time it feels like a full Century already? I’m reading reports that They are Already Confiscating Firearms in the State of Illinois, and Getting Ready to Do Likewise in other Liberal States? Guess that means some/most of You Current “LEO’s” will be Ordered to Go into the Civilian Homes, of Gun Owner’s, to Confiscate Their Heretofore Legally Owner Firearms, an Arrest, or “Legally Kill” them if they Resist!! Now I’m om the “Other Side of the Railroad Tracks”, that divide the Good, from the Rest of the Town! Wonder How many Current “LEO’s” will be Ready to “Turn in Their Firearms”, when they Retire, and Join Me as being just one of the pain old Citizen’s, Subject to Political Whim, and “Bad Laws”, designed to Keep Corrupt Politician’s “Rich, and IN Power? Hope the Politician’s, and the LEO’s, Realize that if Every Legal Gun Owner in America manages to “Take at Least One” LEO, With Him, before being “Legally Murdered”, that when it is all over with, there won’t any Current LEO’s, or Politician’s, left Alive, Together with the Million’s of Plain Old Innocent American Gun Owner’s, and their Families either! That’s Why It’s Called a Civil WAR! Is anyone on this thread not on Medicare LOL! Ruger should give that guy with the LC 9 their own medal. My late wife always used to say-getting old is not for sissy’s. “Age and Treachery will always prevail over Youth and Vigor” (the sig of an old Usenet correspondent, a former diesel/electric submariner). Mas, out of curiosity, what are the most unusual guns you’ve ever had come through a class? Broom-handle Mauser? Webley-Fosbery? (That might make an interesting magazine article!) I’ve been through MAG-40 twice now, once with a Glock and onec with a Ruger LCR. I’ve thought about what I’d use if I ever do it a third time, and have settled on a Swiss Luger. It’s accurate and reliable, and if I didn’t shoot a clean score, the fault would be mine, not the gun’s. In my third Texas concealed handgun license class (1995) I had an old cowboy. As in; he worked on a ranch with cattle, and was in his 80s. He asked if he could shoot the practical with his single-action Colt. He reloaded faster than the double-action revolver folks. He shot faster than the semiauto folks. After firing 50 rounds, from three, seven, and fifteen yards, he had one ragged hole and two fliers less than an inch outside it. He allowed as how he’d been carrying that gun for 40 years. Now I’m 71, and still envious. I’m trying to imagine how that is possible. Were the revolver shooters using speed loaders? The old cowboy would have to eject empty shells one at a time. I assume he would eject one shell, then load a cartridge, rotate the cylinder and so on. A speedloader would have to be quicker than that. Eject ALL the empties, then load ALL the new cartridges. I can see how a single-action revolver can be fired pretty fast. Gripping the gun with my right hand, and then wrapping the left hand around my right hand, I have my left thumb hover over the hammer. Pulling the trigger with the right first finger then cocking the hammer with my left thumb works real well and can be done quickly. So, that he could fire fast makes sense. Thanks for sharing that mind-blowing story. This was a Texas CHL class, so it wasn’t the low-drag shooters Mas works with. Nobody had speedloaders. The revolver folks were ejecting, then loading a cartridge at a time. Also, the reloading wasn’t timed, so the shooters weren’t hurrying. A lot of them would finish shooting their string and wait until everyone else finished and I told them to reload before they unloaded. The cowboy started unloading right after his last shot’s follow-through. Before each exercise shooters would load two, four, five, or six rounds, as I directed. That usually meant the revolver shooters had to close their gun on the correct empty chamber, depending on which way their cylinder revolved. I notice too, that the young little cowardly gang bangers, and wannabes, like to target older people. Isn’t it strange, that they are armed with firearms, they are not even old enough to buy legally? They get them anyway, no matter how many laws are passed. The Social Security aged population is now taking their safety seriously, with gun training classes full of older people, like yours, Mr. Ayoob. Thanks. Hats off to the LC9 shooter. I’ve had experience with only one, my brother’s. It had the heaviest trigger pull I’ve ever experienced on a pistol. Even heavier than the previous worst, my Sig Mosquito .22 on it’s first shot double action pull. At least on the Mosquito the follow up single action pull is more manageable. I will concede that maybe my brother’s LC9 may have been an anomaly . I posted a Comment, yesterday, Regarding the Parts, & upgrades, that Galloway Precision Offers for Ruger SR40 Pistols, among Others, but don’t see it here, so wondered whether You didn’t think it was Postable,or it got lost in the cracks. or? As my grandfather (may he rest in peace) used to say, “Don’t F with old farts–we don’t have the energy to play games and will just go straight to kicking your a**.” Words I’ve lived by in both flavors of application, not just the direct meaning but also seeking out those who’ve Seen It All and Done Most Of It to learn from and reap the benefit of their experience. “Old age and treachery will win over youthful exuberance every time!” One of old geezers that was a mentor in my youth was famous for saying this after he taught us kids something that was utterly amazing to us and common for him. Respect your elders for their knowledge, wisdom and skills are amazing! I had to join this conversation. First Congratulations to the gentleman who shot the LC9 so well; it’s a challenging gun. As I type this, I am sitting in a hospital bed in Dallas- I had my right knee replaced on Monday. I won’t be limping around next time I teach or assist in teaching a class. How is this germane. The two retired Colonels I met at MAG-IC 2016 set the ball in motion. So I owe you a thanks as well. I’m still too young to be a geezer, but I am more bulletproof. Gosh, just imagine how old now must be the men he interviewed for _Police Marksman_ magazine. Never made chief, Frank. Retired at captain rank last year, wrote that book when I was a sergeant. Ah, the reprinting probably said you were a captain, and I didn’t know the difference.